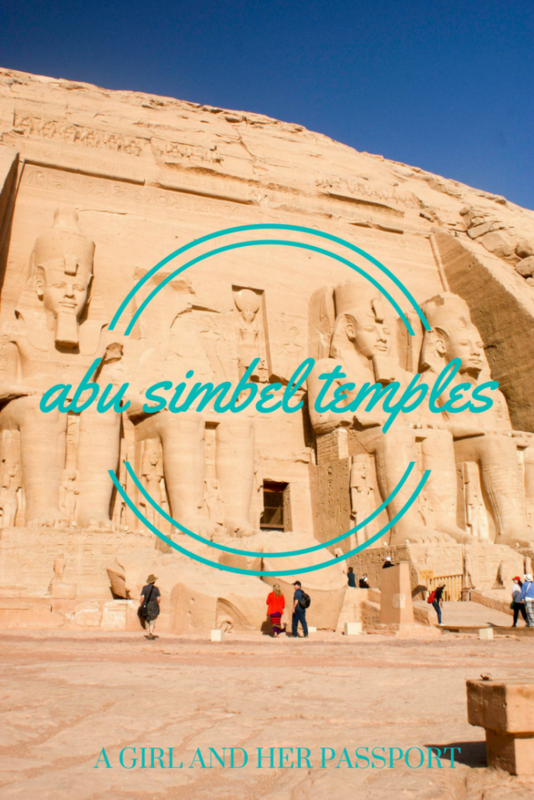 Not only are the temples at Abu Simbel impressive, but they have also been moved from their original location! Between 1964 and 1968, both temples were moved due to the creation of the Aswan High Dam. The temples would be underwater if they had not been moved. The move was to raise them 65 meters. Each monument was cut into blocks and moved piece by piece into their current location. In some places, you can see the cut lines, and they are more obvious inside. However, great care was taken to make sure their positions facing the sun was preserved as the sun enters the larger temple the right way. This happens twice a year, usually around February 22 and October 22 and there is a large festival that takes place at the temples on those days. 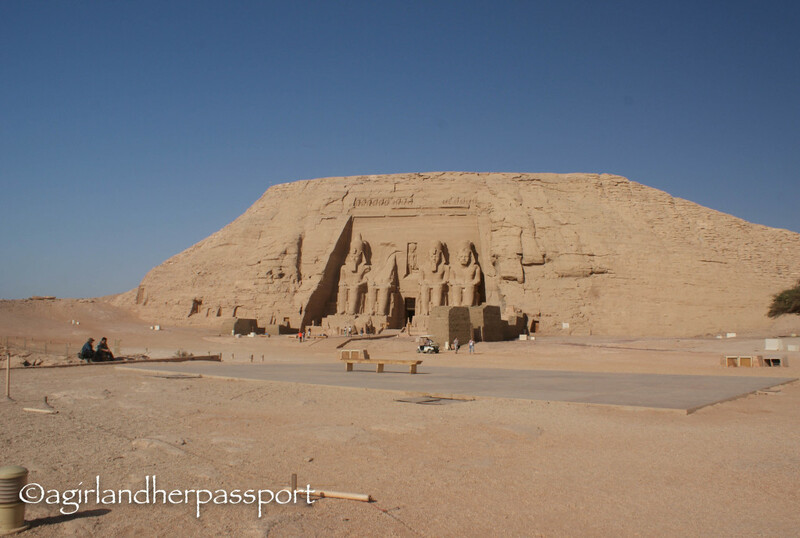 The larger temple is the Sun Temple of Ramses II. This is Ramses the Great. 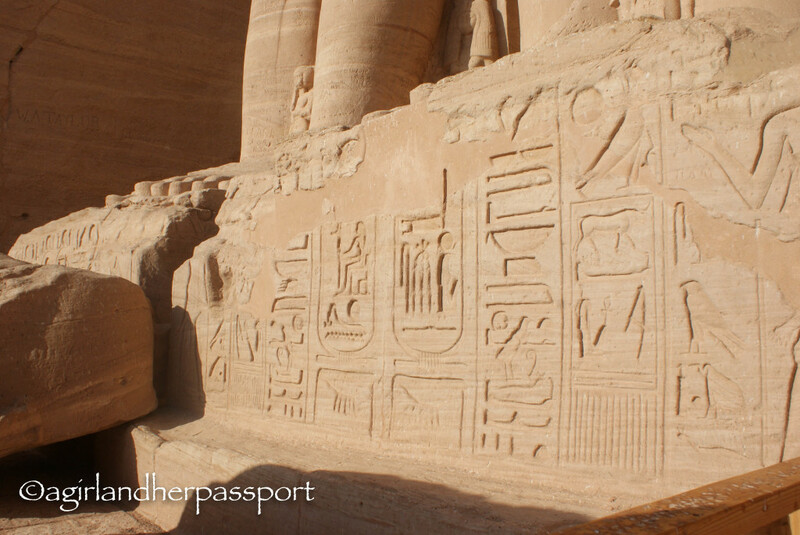 The smaller temple is Nefetari’s Temple of Hathor. Ramses’ temple is built to celebrate three gods, Amun, Ra-Harakhty, and Ptah. Ramses is also depicted in the temple as a god. Nefertari was Ramses II favorite wife. Hathor is the wife of the sun god. Archeologists estimate that it took over 20 years to build these two temples. When originally built they were built into the side of a mountain. What you see now is an artificial dome, built to house the temples. The temples are even more beautiful on the inside. 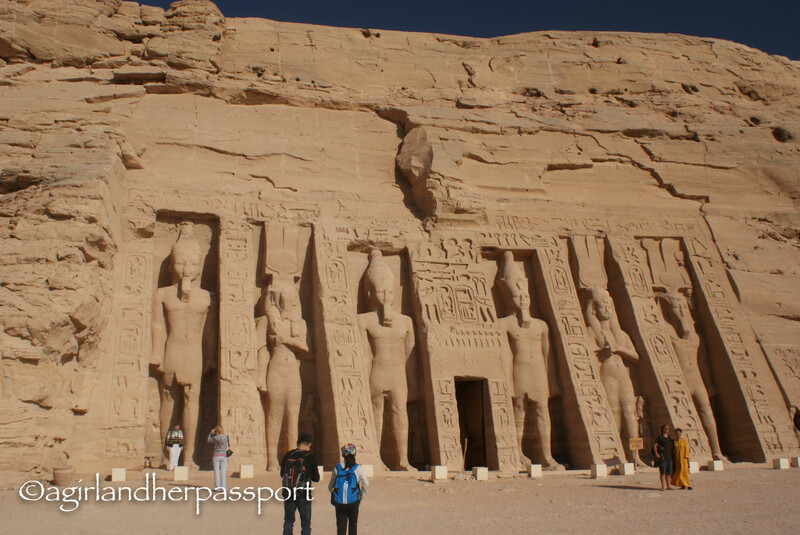 Ramses’ temple is large and heavily decorated and has several rooms. 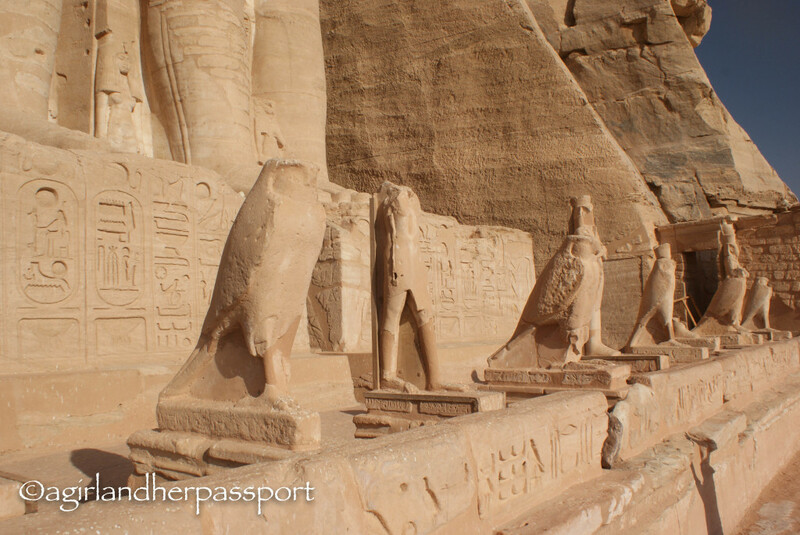 Nefertari’s temple is smaller but no less beautiful. Unfortunately, you cannot take photos inside either temple. Ramses also picked a beautiful setting for his temples. 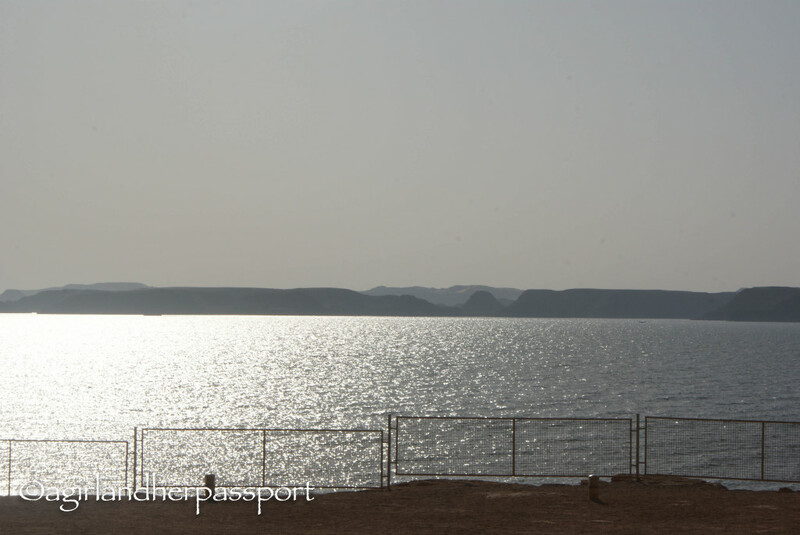 They would have overlooked the Nile River, but now overlook Nasser Lake, which is no less beautiful. Don’t forget to look up! On the very top of the Ramses’ temple is a row of baboons! In several places on this trip, I saw baboons represented and one of the queen’s had her pet baboon mummified and buried with her. I have looked to see why baboons, but there isn’t a clear answer. Some say it was because they are smart, and some say it was a fertility god. There was a baboon god in their culture, so it could be as simple as owning a god. Just be on the lookout for baboons everywhere in ancient Egypt. 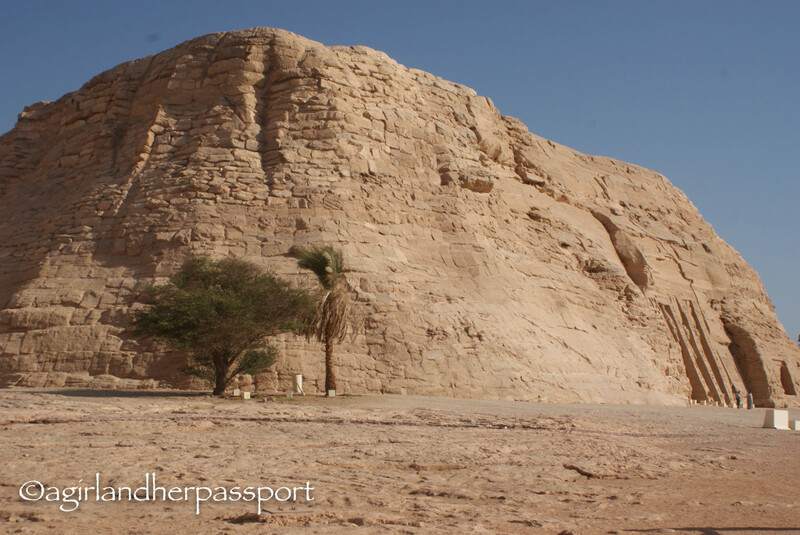 Getting to Abu Simbel is a task. 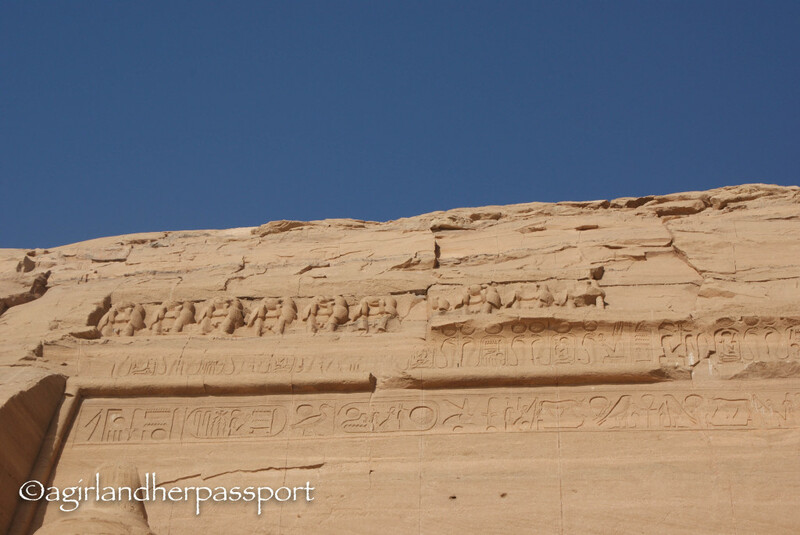 Tourists are not allowed to make the drive by themselves to Abu Simbel due to security concerns. However, my guide stated nothing had happened on the route for a very long time and that we had nothing to worry about. 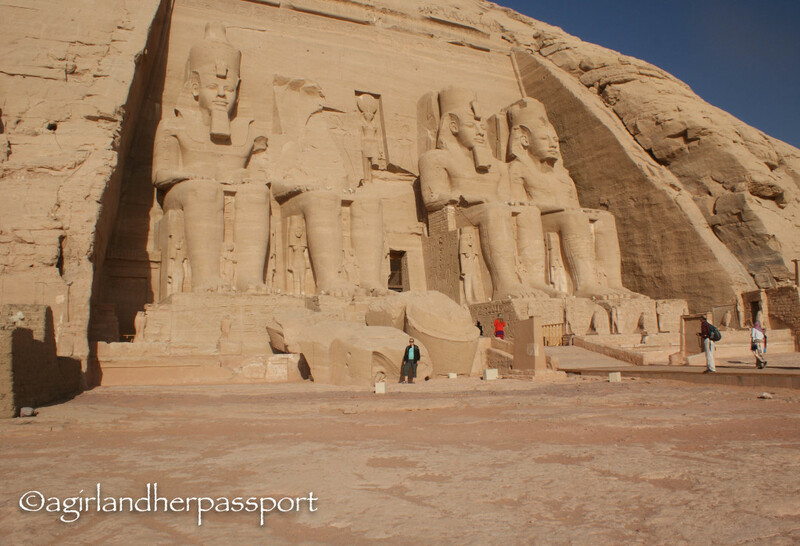 Tourist can fly to Abu Simbel from Aswan, which is a faster option. To drive, you must be a part of the convoy. You should hire a private car or be on a tour. Apparently there is a public bus that leaves from Aswan at 8 AM, but it only allows you an hour and a half before the bus returns to Aswan. 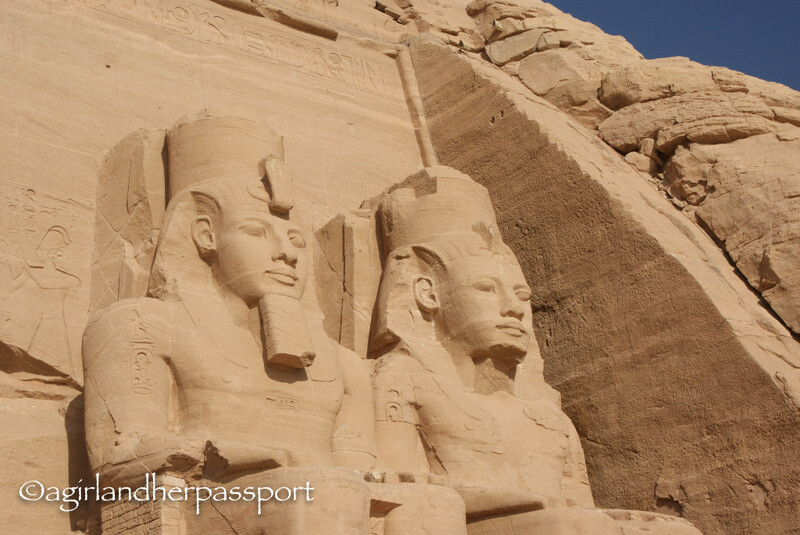 It is about a 4-hour drive to Abu Simbel from Aswan. There are two convoys a day, one at 4 AM and one at 11 AM. While getting up that early was a challenge, I think it is better to go on the earlier one as it wasn’t hot and it seemed like it would be less crowded. We were allowed about two hours at the site and that was plenty of time. Sleep on the bus in the morning and enjoy the desert on the way back. If you get car sick, I highly recommend motion sickness medicine. The road was quiet bumpy, and even I was feeling a bit sick on the way there. I got a Sprite for the way back. We did not stop on the way there, so you need to be able to make the trip without the need for a bathroom. Luckily, our driver stopped when we asked on the way back, but we squatted behind a building that wasn’t so sanity or private. Overall, the getting up early to see Abu Simbel was worth it. Not only did I see two amazing temples, you get to see a part of Egypt people rarely go to now, and the landscape was intriguing to watch. You can also go at night and see the light show and hear a narration of stories. I would only do this if you have seen the temple during the day though as it will look very different. 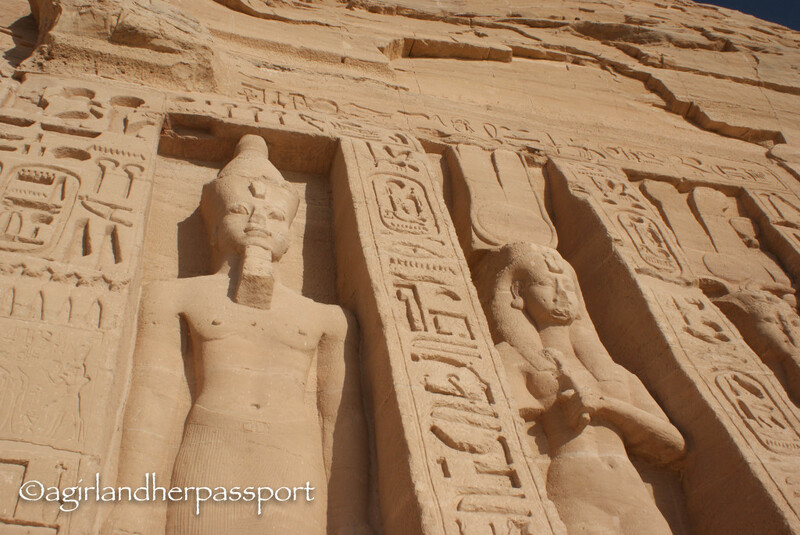 Have you been to the Temples of Abu Simbel? What did you think? You get perfect photograph of the art work at the Abu Simbel Temple, as i listen from someone that taking picture is not allowed in there. Thank you! You can if you pay a fee and it was worth it.